CCSS.ELA-Literacy.W.11-12.3d Use precise words and phrases, telling details, and sensory language to convey a vivid picture of the experiences, events, setting, and/or characters. The school I work for has long excelled at teaching argumentative writing, with a school-wide rubric that fit with Common Core standards when they were released. Of course, that’s the thing about standards, when you do your job well, they really just rename what it is you are doing. This year, though, I’ve been concerned with narrative writing. Everyone teaches it, but everyone does it a little differently and by the time students come to me, they may or may not have been introduced to some of the basic tools required for good narrative writing. There’s a great essay from Stephen King’s book On Writing, “What Writing Is”. I start all of my classes with this essay. I have found that of all the necessary elements of narrative writing, the one my students have struggled with the most is the use of sensory details. To me, this essay drives home not only why sensory details are so important, but also the considerations a writer needs when they decide which details to include. In the essay, King explores the idea of having a “far-seeing place,” somewhere a reader or writer can go to “send or receive” messages to or from another reader or writer. This is one of the first assignments I give my students, to write one page about their far-seeing places. They are tasked with sending me to their places which they won’t be able to accomplish without the use of sensory details. Last week, I gave this assignment to a small creative writing class. Their places were full of trees and birds and flowers. Because in my other life, I am a nature writer, I was overjoyed that these urban teens wanted to escape to more wild spaces, but as a teacher, I was concerned about their use of very general terms. “Bird” is pretty empty, a crow carries a much different connotation than does a dove or a parrot. The same problem exists for flowers: a hibiscus flower is tropical, a rose is cliché, and a sunflower is always happy. And so we jumped into the need for precise and specific language. This was difficult for my students, they know the names of few birds or trees or flowers. They know the connotations of even fewer. Two students wanted to use blue jays in their spaces because they found pictures of them in an image search and found them lovely. When they came to me with their desire to use blue jays in their writing I informed them of the connotation of these birds, “They are quite pretty, but do you know that jays are considered the bullies of the birds?” Both students decided to start their searches again, jays were not appropriate for the peaceful places they were trying to create. For the rest of the semester, I will be able to recall this exercise as I push my students to tell their stories, whether in personal statements or in poetry. Of course I hope that they will become stronger storytellers, but I also hope that they will develop keener observation skills and the desire to know their world and the names of those things contained therein. My summer is coming to a close with students starting back in just two weeks. I will have three preps this semester and two are classes I haven’t taught before. This is scary. Luckily, I know I can lean on some of the tools I’ve tried out in other classes, adapting them for the needs of my new students. I don’t consider myself a particularly tech-savvy teacher. I often come a little late to the table, allowing more innovative colleagues the chance to test new programs before I implement them with my students. Last year, one such colleague introduced me to Animoto, a web based program that allows users to create animated slide shows. The program is really easy to use and there is a free educator’s version that allows students to create ten minute presentations. I used Animoto for one student project – making poem videos. We wrote haikus and then each student created a short video for their haiku. It was a perfect assignment to learn the program because haikus are so short and it was easy to blend text with appropriate images. I made a sample for students using a Jack Kerouac haiku: http://animoto.com/play/Q05ME8XWDKg3sxBxVAXVjw. Later in the year, I used the program again, to make a commercial for one of the classes I will be teaching this year. Elective teachers were given 30 minutes to “sell” their electives to students. I was competing with a film class, art, and entrepreneurship. I was able to make a dynamic presentation that ran on a loop for interested students waiting to talk to me. The event was successful. I had a good group of students choose my class over other offerings. Animoto is incredibly versatile. Teachers can use it to introduce important content or for lessons that might need repeating. Students can use it to make presentations they are proud of, learning to convey information in engaging and creative ways. It does require some complicated set-up, but it is worth the work and Animoto makes it easy with step by step instructions: http://animoto.com/education/classroom. One major concern that keeps coming up around the common core standards is the emphasis on non-fiction reading. In earlier posts, I talked about using novels in content areas to offer more opportunities for content teachers to teach reading. No, novels are not a big part of the common core and they really only show up in the English language arts classes, but novels can be used to build interest in content through their narrative structure. A student who becomes interested in a narrative will be more likely to want to acquire any knowledge that will deepen their understanding of that narrative. The story can be a gateway to the non-fiction writing. This is similar to something the New York Times does on their educator’s network. They teamed up with the Poetry Foundation to pair a poem with an article every week. The poems and the articles aren’t necessarily exact content matches, but they might share similar themes. These pairings are great for teachers who want to challenge their students to reach the higher levels of the critical thinking hierarchy. I think these pairings are exciting because they illustrate how relevant poetry really still is. They can also help us expose our students to a wider variety of writers than the typical teen anthology or AP study guide might include. Next year, I plan to work these pairings into my class every week. I imagine we will have expository activities where students will try to find the links between the poems and articles, but I also hope we can use these as a springboard for the creative writing we will do in class. Perhaps students will find articles to write their own poems about. Hopefully, using these activities will help students become more civically engaged. Hopefully, students will develop stronger, longer lasting interests in poetry. Have you used this tool before? How did you implement these pairings for your students? What concerns would you have for using this tool with your students? If you are a content area teacher trying to figure out how to get more reading into the classroom next year, there’s a tool many good English teachers have been using for years that you might be interested in-Literature Circles. Literature Circles are like book clubs for your classroom. In small groups, students read one book and take turns at different roles. It is a great way to give students more autonomy, which will also help you if your school is using the Danielson model for evaluations. There are many different models for running literature circles and you have to find one that works for you. When I use them, I might have one overarching theme, and then choose books at different lexile levels to make sure all students can participate successfully. For instance, next year I’ll be teaching a special senior class that will focus on media studies. The students have all chosen topics for year-long research projects that have some driving question based on the media. For my literature circles, I might have my higher level groups reading Jennifer Egan’s A Visit from the Goon Squad while lower level readers might have Jay Asher’s The Future of Us. These books won’t answer their questions, but they might help them see different angles for understanding their topics. And hopefully, ideally, reading fiction will give them a welcome break from the scholarly articles they will have to read. The most important factor for successful literature circles is to make sure there is a well-organized routine that, once established, students can follow without much assistance from the teacher. The roles need to be clearly defined, the method for rotating roles needs to be clearly defined, and there has to be a schedule that once put in place, is set in stone. I usually start out with a group contract, giving each student a number. Then, every Friday when literature circles meet, I let them know which number will fill which role. Half the period is devoted to reading and half is work time. I will give students a deadline to finish the book, they are responsible for setting reading schedules and determining how to use the class time. I’ve had groups where every member reads quietly to themselves and I’ve had groups that liked to popcorn read in order to make sure they were all on the same page. They keep all their work in a binder and because each student has a different responsibility each week, no one ever has to worry that one student might slack off and get credit for the work of the rest of the group. The assessments are individual. Roles usually include a visualizer, summarizer, vocabulary finder, connection finder, predictor, and a questioner, but you can also develop roles specific to your content area. There are tons of great resources for literature circles. My favorite is Literature Circles: Voice and Choice in Book Clubs and Reading Groups by Harvey Daniels, but there’s also a lot of free information on the web. Many of the resources were developed for specific grade levels, so there will be something out there that fits your needs. When my school started preparing us for Common Core a couple years ago, I probably grunted and rolled my eyes. In only seven years of teaching, I’ve worked with at least three different sets of standards, each one adopted to make up for the shortcomings of the last, so like most of my peers, I was skeptical. And I still am – no matter how good a set of standards is, the very definition defies differentiation and creativity and individualism. That being said, Common Core does get a lot right. Specifically, the emphasis on reading and writing. Previous standards I’ve used housed reading and writing in the English classrooms alone, but now all content area teachers are reading teachers. But this can be a huge and difficult transition. Reading in the content areas can be, and should be, fun. It offers an opportunity for teachers to reach students on a different level. Recently I read somewhere that storytelling is so powerful because it activates all areas of the brain – that is, when we read about someone eating a hamburger, we might ourselves become hungry; when we read about a tragic loss, we, too, feel a great loss. This power of storytelling gives teachers a new way to reach their students while fulfilling the requirements of common core. Many novels have some connection to typical topics in social studies classes or science classes. Consider a novel like House of the Scorpion, by Nancy Farmer, which deals with the problems of cloning. Or Ruth Ozeki’s All Over Creation, which tackles GMO’s. These novels would fit into biology and environmental science classes as easily as they would fit into literature classes. And the stories would compel students far beyond the reaches of a textbook. One of my favorite parts of summer is the time I have for reading. I try to read books of my own choosing as well as titles that I hope will inform my teaching the following year. This summer, I’ll be working to compile a database of books to suggest to content area teachers. I already have a pretty hefty list of books for science and social studies teachers, but math seems to be a trickier topic to tackle, perhaps this will be my summer writing project? A novel of how algebra saves the world. Do you have any common core resources you would like to share and help Elizabeth with her database of books to suggest to content area teachers--especially math resources? Please share with her by commenting below. National Poetry Month has been behind us for a few weeks and the end of the year is close enough to count the days. This is always a difficult time for me, trying to keep students engaged while I am having a hard time staying professional myself. This makes it an excellent time to tackle revision and audience. If you did even a few activities for National Poetry Month, your students most likely have a handful of first drafts that you haven’t had the time to go over thoroughly. And (not that you want to) you most likely realize that if you took your red pen to your students’ poems, you may discourage them forever from literary endeavors. So how do you encourage them to continue? I’ve always found that students will resist revision when they see me as their only audience, but I’ve been able to gain leverage when I’ve offered them a wider audience. In fact, there is a whole section in the Common Core Writing standards about production and distribution. If you haven’t covered those standards yet, this would be a great way to get to them. Teen Ink and Cicada are great teen literary magazines to which students could submit work. Figment is a sort of social networking site where students can share their writing with other students and get feedback. There are actually a ton of great places your students can send their work but warn them: while they aren’t all bad, presses that require a reading fee should be treated with suspicion. If you send students to find their own opportunities, make sure they check with you so they don’t get scammed. As students explore these publications, they begin to recognize the weaknesses in their own work. Often, they will choose to revise pieces without being asked if they know someone besides the teacher will be reading it. When they ask me for advice, I'm ready to give it; I keep a list of revision tips handy for students. Add a metaphor, beef up the imagery, ask a friend to read it and tell you what they think it's about. Of course, you can also put together your own school literary magazine, if you don’t already have one. I created a Google form so students can submit their work online. Then I just need to copy and paste into a Publisher master document I created a couple years ago. Once you build your format, it’s pretty easy to maintain. Students love seeing the work of their peers in print; it’s a great way to trick reluctant readers. April may be the cruelest month, but as the director of a high school writing center, it may just be my favorite month. As you probably know, it is National Poetry Month, the month when I get to thrust upon my co-workers my own literary agenda. Because I do have an agenda. My job is just my vehicle in my mission of corrupting young minds by engaging them in the act of reading poetry. I dream of a world in which the poetry section in Barnes and Noble actually takes up more space than the Teen Vampire section. And fortunately, I have many co-conspirators. Organizations like the Poetry Foundation offer many activities you can use to bring poetry into the classroom. Activities so well put together, you will feel like you are taking the easy way out by not crafting your own amazing poetry filled curriculum. My favorite, because it is so easy and so much fun, is Poem in your Pocket Day. Here you will find ideas for participating on April 18th and a stack of poems you can print and handout. Last year, our writing center distributed poems to all staff and to students who visited us. Throughout the day, teachers shared their pocket poems and offered students extra credit to share the poem they brought. We had our army of student writing coaches share their poems throughout the day, too. When I studied education in college, I had a professor who always insisted we include an “umbrella” plan with the imaginary lessons we designed for her class. I am not sure if this is a common practice, but it’s simple enough to explain. You start your lesson with an objective for the student for twenty years from now, and work back down to the objective for the day. So, your objective for the day may be to learn adverbs and adjectives, but your objective for twenty years from now may have something to do with kindness when talking to others. I run a high school writing center with a small library. If you asked my administration, my objective is to support students in their academic research and writing. But our school serves a community in which having an education is not a norm and sadly, students are afraid to enjoy learning or to exhibit curiosity. After my first year in this position, I realized that on my umbrella plan, in the twenty year bracket, I need an objective that combats this culture. So, I continue to support students academically. In addition to helping them support thesis statements and showing them how to proof their own papers, I also have tried to introduce programs that will encourage students to enjoy reading and writing for its own sake. I don’t know if my students will continue to enjoy reading and writing twenty years from now, but I do know that the culture is starting to change, little by little. Please join me in my bi-monthly blog post series as I explore the journey that I am taking with students in thinking about their Umbrella Plan. Her chapbook, As Wild Animals, is available through Dancing Girl Press. 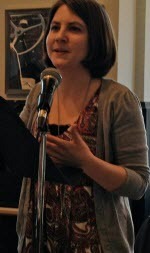 She has an MFA in Poetry from Pacific University in Oregon. Reach out and greet Elizabeth by commenting on this blog post below.